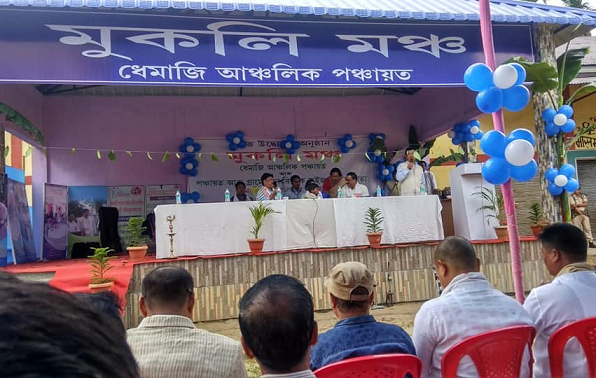 Dhemaji Anchalik Panchayat has constructed a Mukali Mancha, a raised open stage or platform in its office premise, which was ceremonially inaugurated in presence of department officials on Sunday. The fund amounting to Rs 11 lakh for construction of the mancha was granted under 5th Assam Finance Commission Service. The construction works include erection of boundary wall surrounding the office campus and other infrastructure development therein. This is the first effort of open stage construction through government fund in the district, which is suited for conducting open meeting, rally, festive celebration and other community programmes. Inaugurating the Mukali Manch (Open stage), Dhemaji Deputy Commissioner Roshni Aparanji Korati hoped that the stage would provide opportunity for holding open meeting, festival and other celebrations besides revenue generation. A quiz competition among panchayat officials from different panchayats under Dhemaji Anchalik Panchayat was conducted on the occasion. The participants were quizzed on the guidelines for implementation of various panchayat & rural development schemes. Chamarajaan Gaon Panchayat won the first prize, while second and third prizes were bagged by Ghuguha and Jiyadhal panchayats respectively. Among other dignitaries, SIRD (Guwahati) Deputy Director Pabitra Kalita, Chief Executive Officer (ZP) Prafulla Ch Deori, District Programme Manager (Zilla Parishad) Debajit Dutta, District Programme Manager (ASRLM) Indrajit Gam and Dhemaji BDO Nabin Ch Kaman were present.